Burger winningly combines relatively rare elements--a turn-of-the-century setting, an assured star turn by Edward Norton, and a deft Philip Glass score--to pull off a tricked-out romantic thriller. 110 min. Yari Film Group. Director: Neil Burger. Cast: Edward Norton, Paul Giamatti, Jessica Biel, Rufus Sewell, Eddie Marsan. For the sake of entertainment, magic teases out the tension between credibility and skepticism. Many magician's marks want to believe against belief that supernatural ability is within our grasp, while others won't be satsified until they've rationalized each trick. In writer-director Neil Burger's The Illusionist, one man's magic is another man's fraud, and sleight-of-hand deceit isn't limited to performance artists and stages. Burger winningly combines relatively rare elements—a turn-of-the-century setting, an assured star turn by Edward Norton, and a deft Philip Glass score—to pull off a tricked-out romantic thriller. Norton plays Eisenheim, a self-made magician whose adolescent romance with a socialite resurfaces when he chances to meet her again in Vienna. Unfortunately, Sophie (Jessica Biel) is now engaged to the dastardly, abusive Crown Prince Leopold (Rufus Sewell). When a murder occurs, Eisenheim becomes a prime and trickier-than-usual suspect, one whose unspoken romantic tussling with Leopold motivates conspiratorial power plays on the parts of both men. The mystery isn't hard to solve, and the romance is strictly paperback ("I kept thinking I'd find it around the next corner...a real mystery," says Eisenheim, but the only one is "why my heart couldn't let go of you"). Still, it's entertaining to watch it all play out, especially with Paul Giamatti's Chief Inspector Uhl on the case. A meddlesome fin-de-siècle Columbo, Uhl struggles with a conflict of interest: he's beholden to emperor-to-be Leopold. Burger does a smart job of adapting Pulitzer Prize-winner Steven Millhauser's short story "Eisenheim the Illusionist," and teasing out its themes of the use of power behind the veil of a convincing illusion. "Where does power flow from?" asks Eisenstein. "Skill or destiny or divine right?" All of the above, perhaps, but it's intellect that allows the magician publicly and consistently to stick it to Leopold, who promises, "Everything can and will be explained, all mysteries penetrated," but can't pull Eisenheim's sword from a stone. To retain a sense of mystery, Burger forgivably cheats tweaking well-researched period stage illusions into exaggerated, practically impossible tricks. It all plays into Burger's well-modulated tone, set right from the Glass overture and shfting, misty credits. Period detail is quite fine, with a tinge of sepia, Prague locations, and handsome costuming by Ngila Dickson. Norton's elegantly controlled performance likewise sets a tone well complimented by Sewell and Biel and counterpointed by Giamatti's endearing gracelessness. In challenging the monarchy, Eisenheim becomes a provocateur of greater scope than the average magician. Though he's a sly social critic, he has no particular political design, and his prevailing interest is his own happiness. Apologizing if he has given "false hope," he tells his hysterical audience, "My intention has only been to entertain." For the intents and purposes of The Illusionist, mission accomplished. 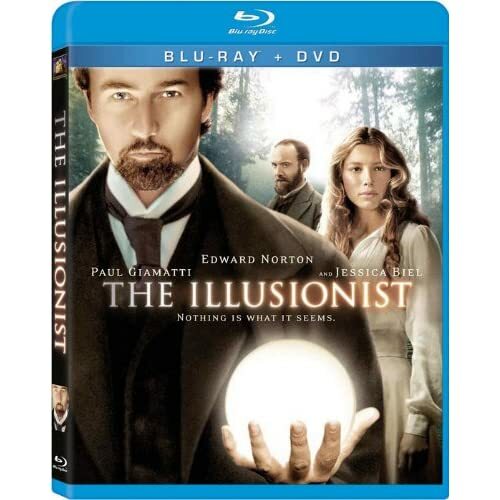 Fox does a very nice job of conjuring The Illusionist in its Blu-ray debut, part of a Blu-ray + DVD combo pack. The image quality is excellent, accurately presenting the film's period ambience (some of which intentionally emulates old-looking film) and golden hues. Black level is strong, and detail is impressive, handily besting the DVD version. The lossless DTS-HD Master Audio 5.1 mix maximizes the film's audio with nice immersion, full body to the music, and clear, well-prioritized dialogue. For bonus features, head onto the DVD (Disc 2), which includes a feature audio commentary by writer/director Neil Burger. In this most substantial and informative of the extras, Burger covers all of the bases: his intentions in writing the film (adapted from Steven Millhauser's short story "Eisenheim the Illusionist"), working with the cast, and production details. 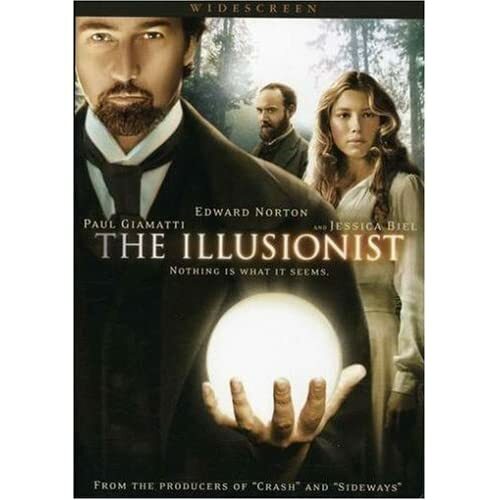 "The Making of The Illusionist" (3:59, SD) is a brief EPK featurette with interview clips of Edward Norton, Jessica Biel, Rufus Sewell, and Paul Giamatti. "Jessica Biel on The Illusionist" (1:29, SD) includes a few more comments from Biel, taken from the same interview. Last up is the film's "Theatrical Trailer" (2:30, SD). All site content © 2000-2019 Peter Canavese. Page generated at 04/18/2019 02:13:17AM.